PEARL HARBOR, Hawaii -- Japanese Prime Minister Shinzo Abe arrived in Hawaii on Monday to recognize the Japanese attacks on Pearl Harbor in 1941. Abe landed at Joint Base Pearl Harbor-Hickam for the historic visit. He will be the first Japanese prime minister to visit the memorial that honors sailors and Marines killed in the attack that spurred America to enter World War II. Gov. David Ige and other dignitaries greeted Abe Monday at Joint Base Pearl Harbor-Hickam, after his plane touched down about 9 a.m., CBS affiliate KGMB reports. After landing, Abe headed to the National Memorial Cemetery of the Pacific at Punchbowl and Makiki Cemetery to lay wreaths, a tradition that other Japanese prime ministers have followed during their visits to Hawaii. Also on Monday, Abe visited a memorial to those who died when a U.S. Navy submarine collided with Japanese high school fishing vessel Ehime Maru 15 years ago. Nine boys and men died when the USS Greeneville rammed the fishing vessel off Oahu on Feb. 9, 2001. The most significant event during Abe’s stay in the islands will come Tuesday, when the prime minister will join President Barack Obama in a visit to the USS Arizona Memorial. The memorial will be closed to the public Tuesday. The visit comes six months after Mr. Obama became the first sitting American president to visit Hiroshima for victims of the U.S. atomic bombing of that city at the end of the same war. 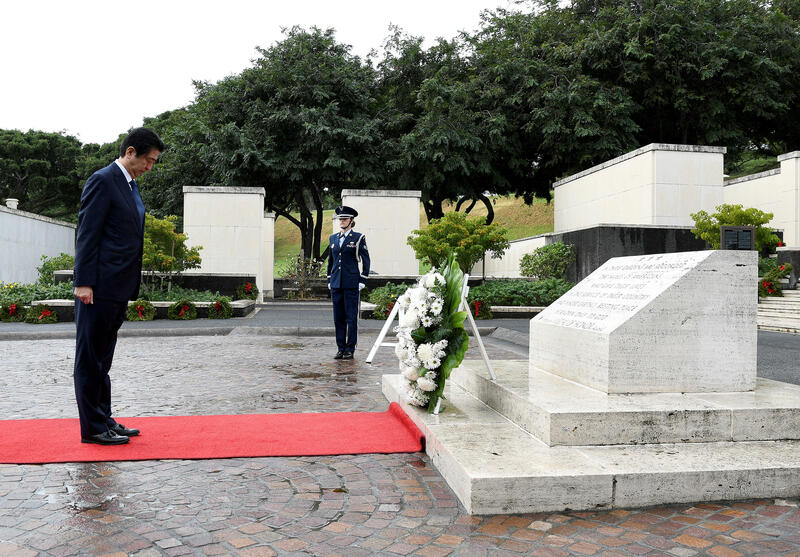 On Monday, Abe visited the Ehime Maru Memorial near downtown Honolulu. Nine boys and men died when a U.S. Navy submarine collided with their Japanese fishing vessel off Oahu on Feb. 9. 2001. Hawaii Gov. David Ige and Caroline Kennedy, U.S. ambassador to Japan, were among those who joined Abe for the solemn memorial visit.